Lovely Double White 10mm round pearls mounted on double cup sterling silver from our ‘Private’ collection. For the bride who loves the classical beauty of pearls with silver. An alternative to the simple stud pearl earring. A hand made design from Perth, West Australia. Made in Clip on, please just ask. Perfection. At last we have created this heavenly 10mm double cup set earring for our online stores. Divine double pearl earrings set with sterling silver that looks a million dollars and is reasonably priced. 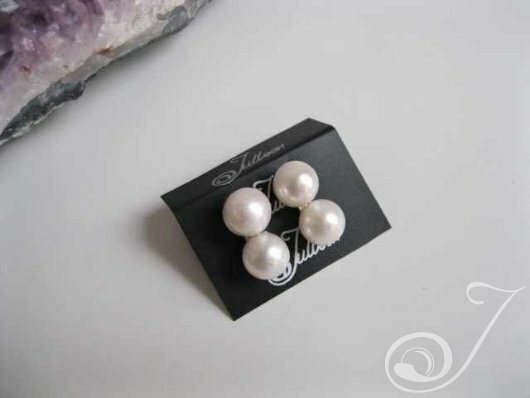 You need not do expensive ..when choosing a pearl earring by Julleen for a wedding day or for any occasion. The double pearl earring is favoured by many for their special day. Here’s a look at 3 real people wearing our much desired designer pearl earring. Angela on her wedding day and Chelsea Clinton with the Princess Grace on her wedding day all wearing our cultured double pearl and sterling silver earring. This styles also comes in clip on. PLEASE mention if you want the clip on version at check out.